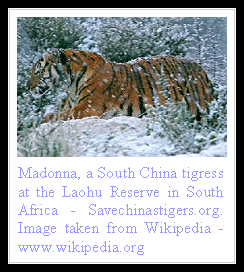 South China tigers are the rarest in the world. Having resided for centuries in south central provinces of China, they are now teetering on the brink of extinction. This is largely owing to decades of persecution under Chairman Mao's regime, when they were declared as pests and eradicated in nature. As a result no evidence has been documented of the big cats' presence in the wild for the last twenty five years. Believed to be extinct in the wild, only a handful of these tigers exist in captivity and these too are threatened by a small and impure gene pool. Few organizations are working towards the protection of these big cats. Among them is 'Save China's Tigers', a charity founded in the year 2000 to act for the welfare of these critically endangered felines. Based in Laohu Valley Reserve near Philippolis, South Africa, this conservation group aims to increase the numbers of the South Chinese Tigers in captivity to an extent where they can be successfully reintroduced to designated wildlife parks in China. It's a rewilding project in essence and works by teaching captive bred tigers to hunt and fend for themselves in the wild. Starting with just a couple of cubs, Save China's Tigers has made great headway in the last few years. Three litters of tiger cubs have been born in the South African reserve, and adults have all successfully demonstrated their ability to independently catch wild prey. Still, it is early days in the conservation of the Chinese tigers and it remains to be seen if sufficient numbers of these majestic cats can be reached so that they can sustain themselves in the wild and survive as a subspecies. One thing is for certain - this is the last chance for the South Chinese tigers, believed by some to be the oldest tigers of them all, and it still requires a lot of initiative and effort on part of conservationists and scientists before the roar of the tiger is heard once again in the forests of China. It would be a total shame if these rare tigers do not come back from the brink of extinction. Hopefully the efforts to protect them and bring back their numbers is successful. Thanks for bringing awareness to these beautiful animals. The horrid Chairman Mao brought so much misery to his country. I hope these beautiful cats can survive his legacy and not only survive, but thrive! What an amazingly beautiful photo. What a beeyootiful pickshure of the tigur. We Ballicai are glad that Save China's Tigers is makin headway. Tigers are beeyootiful majestick animals and must be saved and proteckted. China simply does not have a good reputation regarding any cat! I hope this project is successful!! !